Deceivingly beautiful French broom is invading California forestland. A glorious foothill display of yellow flowers and their spicy-sweet fragrance may delight the senses, but they pose a serious problem for California. Scotch, Spanish and French broom were introduced from Europe in the mid-1800s as lovely, easy-to-grow garden accents and land stabilizers, but they have become aggressive invaders threatening native plants and increasing fire hazards. The characteristics of invasive brooms cause several problems. The plants grow large and upright, developing thick trunks at the base. After its relatively short life span - typically 7 to 8 years, 15 at the most – they die and become tinder-dry woody skeletons that can burn high and hot. The brooms are also a member of the legume family. Legumes are unique in the plant world. They have evolved a symbiotic relationship with bacteria that live on their roots. The bacteria are able to pull nitrogen from the atmosphere and deposit it into the soil, where it feeds the plant. Large stands of broom are also a significant concern for rangeland managers. Cows don’t like the taste; only goats will eat it. When the plant is grazed off or cut back, it readily re-sprouts from the crown. The plant’s spread is bolstered by its intriguing ability to scatter seeds widely. Brooms grow seed pods that are naturally spring loaded. When the seeds are ready for dispersal, they fling from the pod with the force of a tiny explosion. In collaboration with the non-profit California Invasive Plant Council, which received a grant from the Sierra Nevada Conservancy, Oneto is working to eradicate broom from a particularly sensitive location. Highway 120, for many the “gateway to Yosemite,” has populations of French and Spanish broom. “We’ve started by mapping the broom along Highway 120 and plan to eliminate the population to prevent it from moving further into the forest and eventually into Yosemite National Park,” Oneto said. The grant is providing the funding for environmental and regulatory compliance so that control measures can be implemented. “Once the regulatory compliance is complete, the project will be shovel-ready and we can begin treatment,” Oneto said. 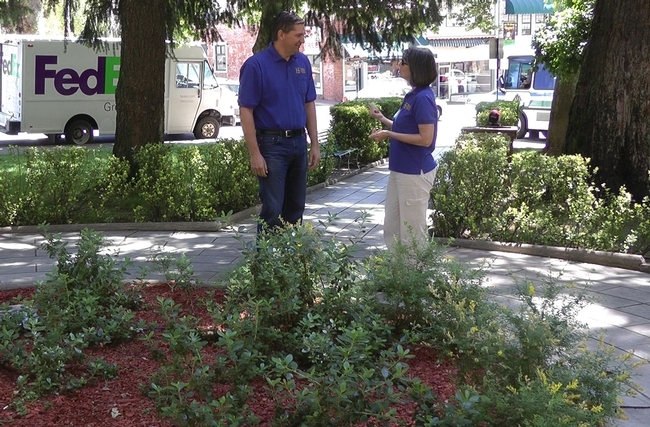 Scott Oneto (left) and Rebecca Miller-Crips stand near landscaping in Sonora's Courthouse Park where invasive French broom was planted as an ornamental. Despite French and Spanish broom’s invasive nature, the heat-tolerant greenery and pea-like spring floral display still inspire people to plant them in landscapes and even parks. Brooms are occasionally found in retail nurseries along with a cousin, called “sweet broom,” that is touted as a sterile, non-invasive substitute. However, DNA research conducted by scientists in the Department of Plant Sciences at UC Davis found that sweet broom hybridizes with French broom, potentially contributing to the invasive weed problem. 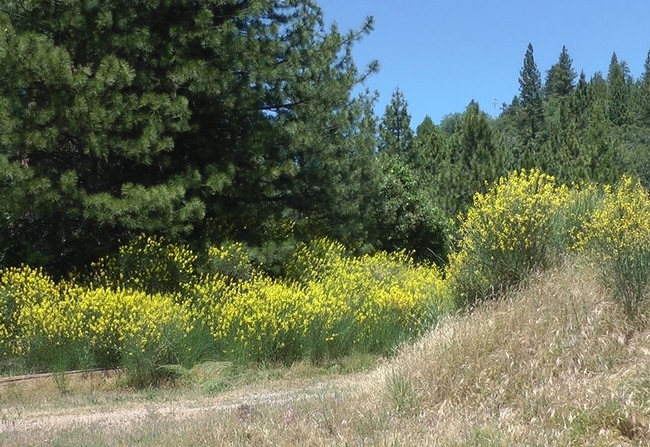 “If broom is growing wild or as an ornamental on your property, we suggest you remove it and replace it with a non-invasive plant,” said Rebecca Miller-Cripps, natural resources program representative with UCCE Central Sierra. For example, forsythia produces yellow flowers and a shrub of about the same size and shape as brooms, but isn’t invasive, she said.